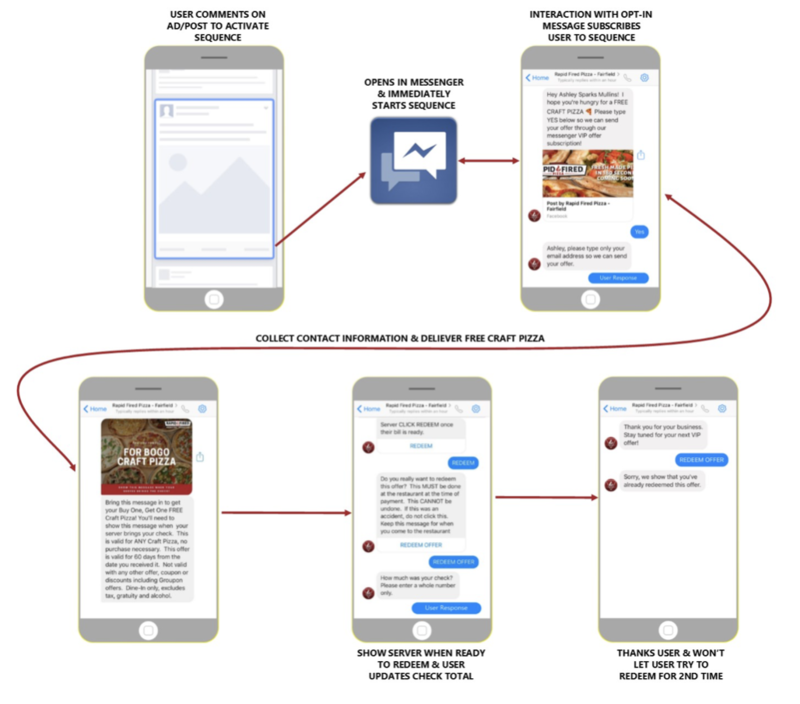 Spoiler alert: a restaurant chatbot strategy is the key to full bellies (it doesn’t hurt if your food is great, either). 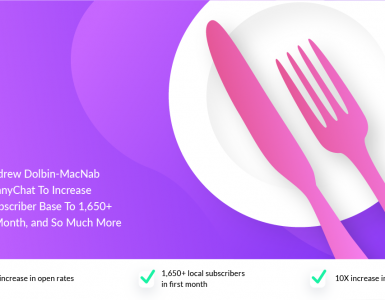 Gone are the days of sending broad direct mail out to the masses and hoping it converts, now there’s a digital, trackable, and redeemable way to engage with your community… and get them fed! 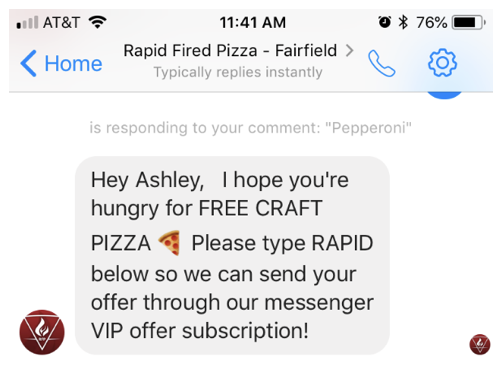 In this post we’ll be digging into exactly what worked for Rapid Fired Pizza’s new location opening in Fairfield, Ohio, and how you can duplicate the easy setup for your own business or clients with restaurants and messenger chatbots. We’d say this is pretty dang ideal, isn’t it? This one is simple, and a goal for most restaurants: we wanted to target residences in the surrounding areas and give them a reason to come into the restaurant. Our offer is a buy one, get one free pizza. 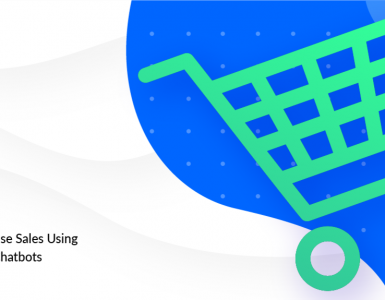 This offer will be redeemed through Facebook Messenger, the customer inputs the check total so that the sales are tracked through a Google Sheet. This ad was really simple and eye catching, showing delicious pizzas. 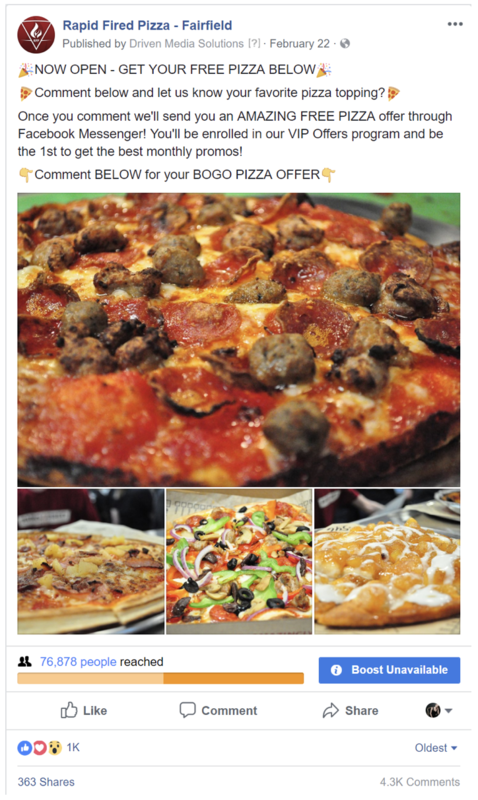 The ad copy was very clear on how to get the free pizza offer and expectations. Our targeting was very simple. We targeted everyone within the city limits, and different age groups and gender. Here you can see our different ad sets. We spent $216.76 and got 208 comments at an average $1.04 cost per comment. With the lowest being .63 cents cost per comment. Here is our full Opt-In Sequence. We send them the first flow that includes email capture. Then, if they do not redeem the offer (triggered by a tag) they will be reminded 20 days later. 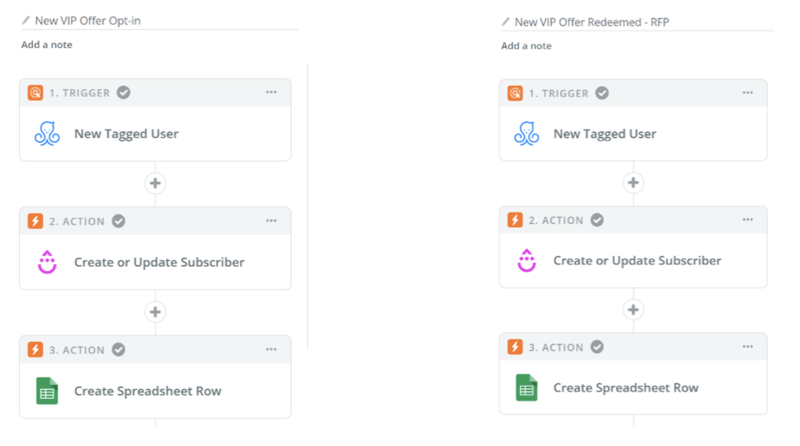 We track redemptions by applying a tag when they enter the check total – saving that to a custom field to pull into our Google Sheet. This allows us to track how much they spend – which is where people struggle the most when deploying a restaurant chatbot strategy. They will then receive a ‘Thank you’ message and to stay tuned for the next offer. 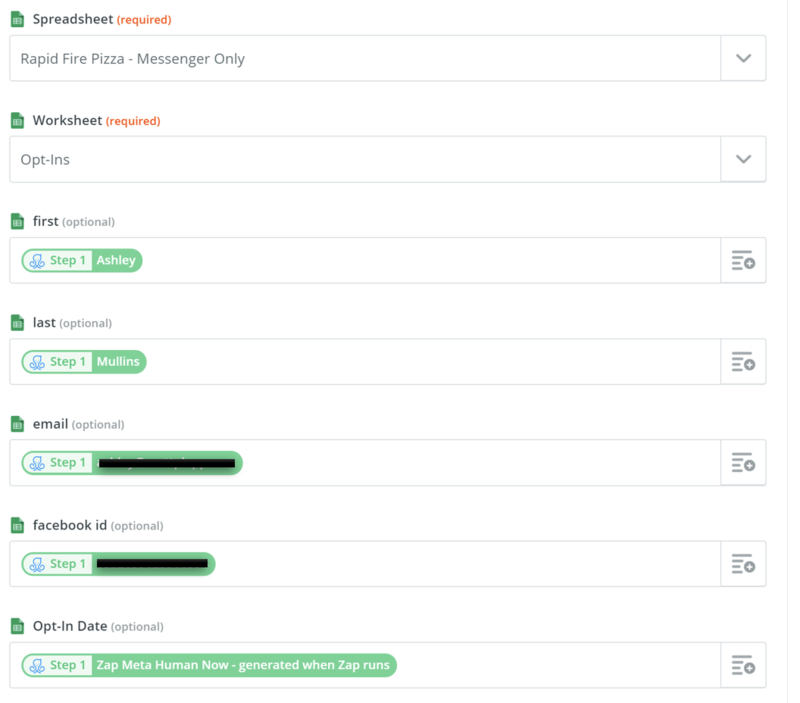 We use Zapier as a way to connect our subscribers from ManyChat to Drip to Google Sheets. Our Opt-In & Redeemed Zaps are two very simple 3-step processes. 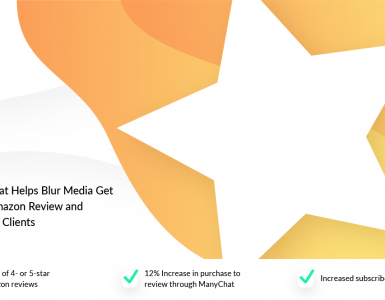 Our opt-in zap starts with a ‘New Tagged User’ from ManyChat. Our first tag is appiled when the user successfully imputs their email address. 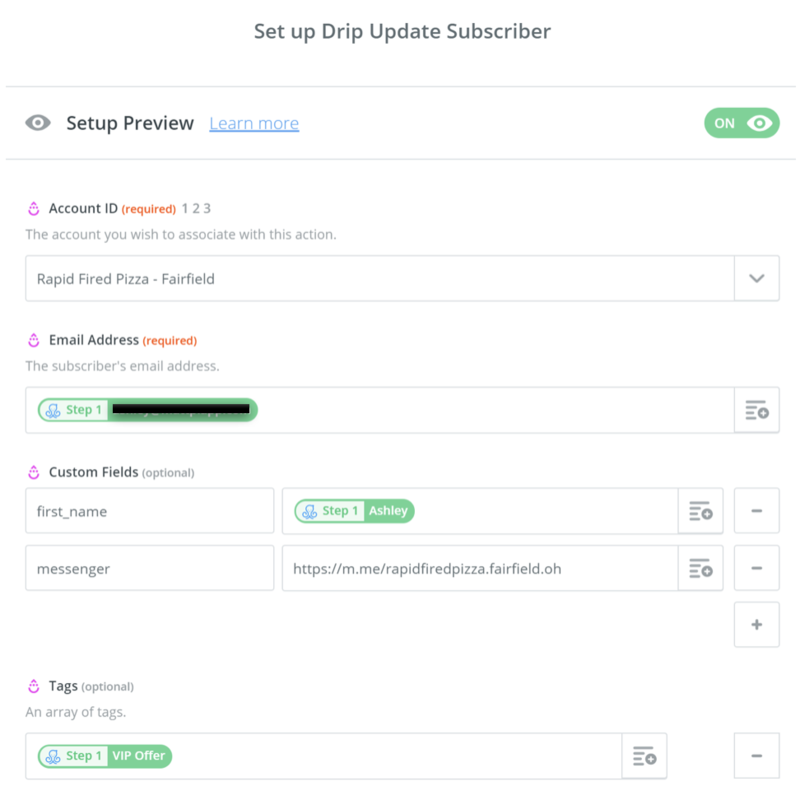 Next is ‘Create or Update Subscriber’ in Drip. We are storing the email address to send them later broadcasts through Drip. In Drip, we are also creating a custom audience for Facebook, which is populating a ‘Lookalike Audience’ so we can target more people who look like the current customers. 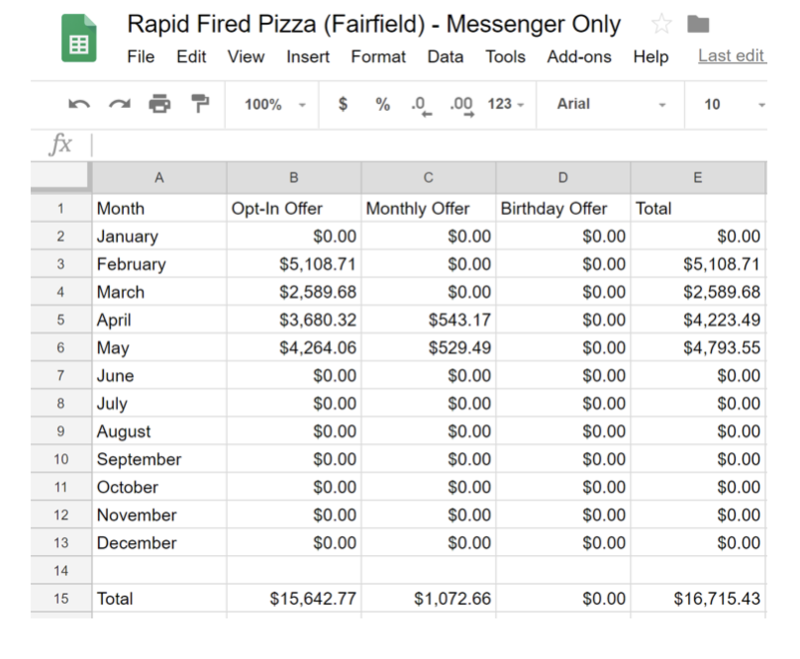 Our final step in our Opt-In Zap is our Google Sheet. 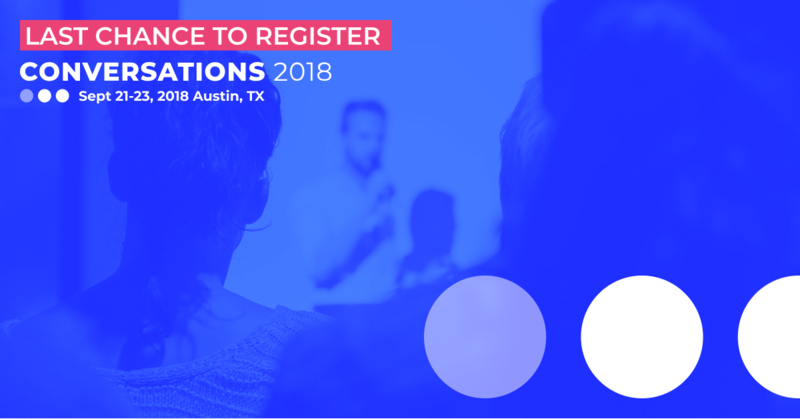 We are also storing information on an Opt-In worksheet to collect totals of number of opt-ins. This will have the same three steps, but we are collecting slightly different information so we can track the money spent with our redeemed offer. First up is ‘New Tagged User’ from ManyChat. Our redeemed tag is appiled when the user successfully imputs the check total that was shown above. Next is ‘Create or Update Subscriber’ in Drip. In Drip we are also creating a custom audience for Facebook, which is populating a ‘Lookalike Audience’ so we can target more people who look like the current customers. When the redeemed tag is appied in Drip we are triggering a workflow. 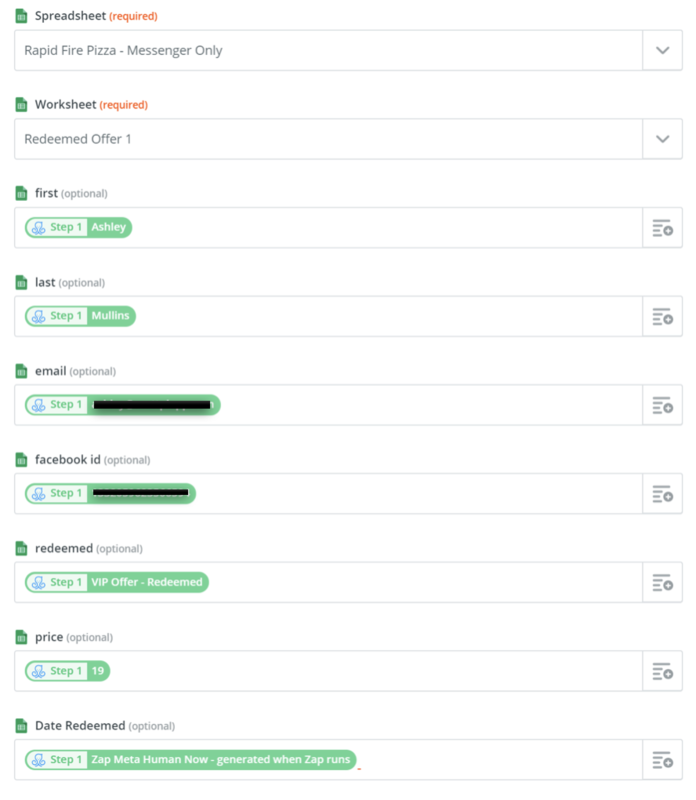 Here is what our Zap and Drip Workflows look like. The final step in the Redeemed Zap is adding to the Google Sheet. In this, we want to track how much they are spending. 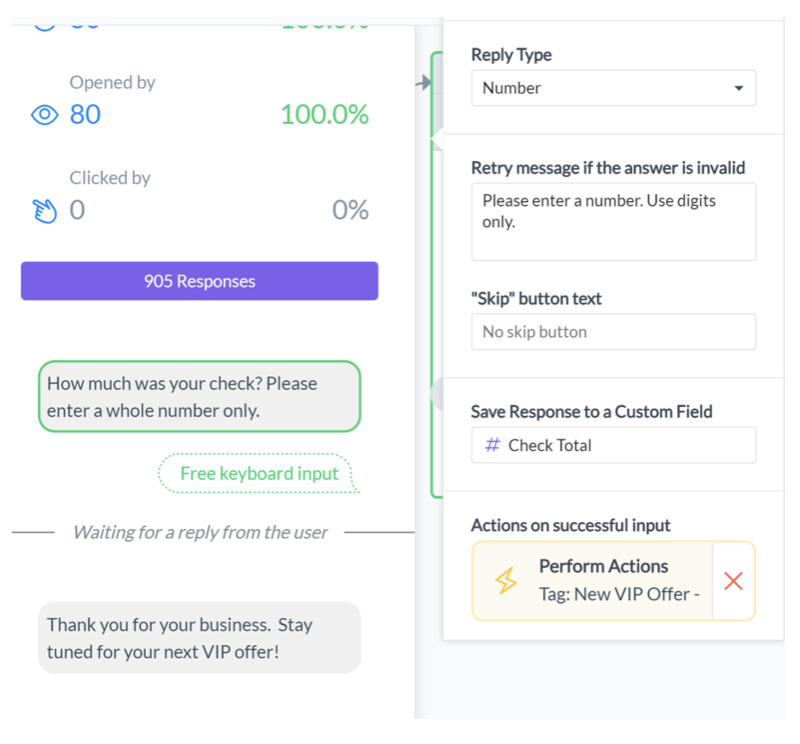 It’s incredibly important to track your results to find out how much your restaurant chatbot strategy is bringing into your restaurant and see how you can continue investing to get your ads in front of similar audiences. 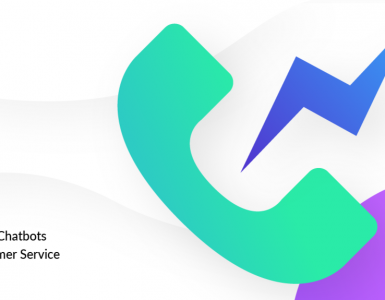 For us, since the end of February we have generated $16,715.43 in total sales for our clients just through a simple 3-step messenger chatbot, and built up a subscriber list of 3,846. Check out the document below to see our Opt-In offers totals and monthly offer totals (as of May 29, 2018). 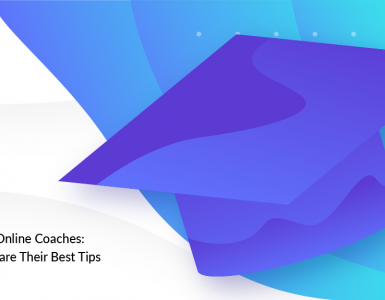 The best part of this strategy is its digital, trackable, and redeemable nature — and it’s just the tip of the iceberg of what’s possible with Messenger Marketing! How can you use this in your own clients’ business? Matt Plapp is the President of Driven Media Solutions, a full service marketing firm located in Cincinnati & Northern Kentucky. 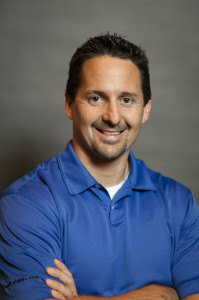 He has over 18+ years of experience in small business marketing in the region. From Corporate America to Locally Owned companies, he’s been involved in most forms of marketing and have seen the good, the bad and the ugly. His goal is to help businesses create and implement a plan that will work as a foundation for their brand. If you want to take your sales, profits and BRAND to the next level contact Matt for a FREE consultation. at which stage in the flow did the restaurant ask for customer’s email? I just couldn’t find it in the post. Very beginning, they comment, this activates the flow, before they get the voucher they enter their email. You wrote you spend $216.76 and got 208 comments. Which is $1.04 cost per comment. On the whole campaign you spend $2,504.31 in ads and got 3,846 subscribers. Which is just $0.65 per subscriber. What did you do that they got so much cheaper? So happy to have met you at Conversations! 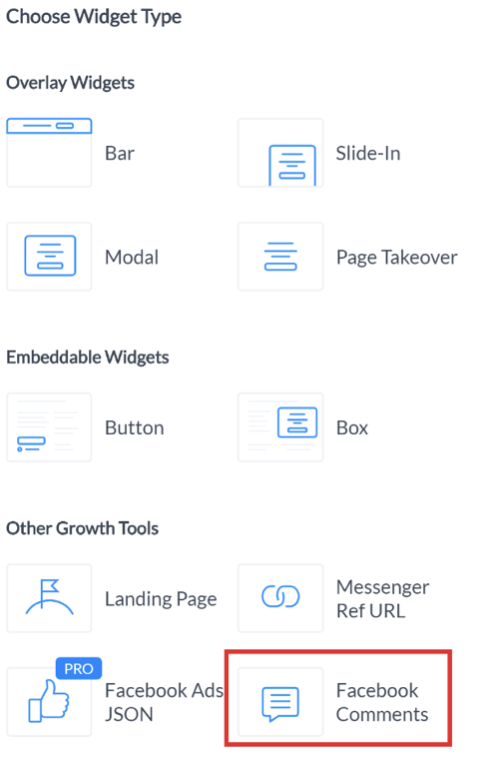 I need to sharpen my skills with Messenger and get to learn about Zapier. How did you make it so that the user can’t use the REDEEM button a second time? That’s an awesome return on ad spend!